I talked to the interior shop this morning and they finally received my 4k deposit. I'm relieved because I sent it over a week ago. The good news is they have my material selections in stock so work can begin right away. I chose a tan leather for the seats, an off white color for the headliner and medium gray for the carpet. I'm assuming this means they'll start Monday Dec 28th which, if I believe the 3 week estimate, puts me around the 18th of Jan. I suspect it may take at least a week longer than that. The bad news is that the annual is due Feb 1. So I'll be on a tight schedule... best case I'll get the plane back here and then have yet more down time... and likely a big hit to the wallet, especially if I decide to overhaul the props. Welcome to aircraft ownership! Worse case the job will take longer than expected and I'll be in a time crunch for the return flight with unpredictable Wx this time of year, or even worse, the annual will expire and I'll have to get it ferried somewhere to do the annual on the east coast. That is so far from ideal I don't even want to think about it. Oh well, it will all be worth it once I finally get the plane. I just spent 8 hours in the car driving from the Bay Area to Malibu for xmas with family. Let's see, 8 hour car ride with two small kids or 1.5 hrs in the Baron.... hmmm, whatever it costs and however long it takes I'll just remind myself of that drive and consider it a bargain!! Today I got an email from a guy that also wanted to buy my plane but was just a little slower on the draw... he offered to buy my plane from me "if I wanted to get my money back out". Ummm, no thanks! but it made me feel good because I guess that must mean I got a good deal! Some shots of the G600 from the delivery flight. 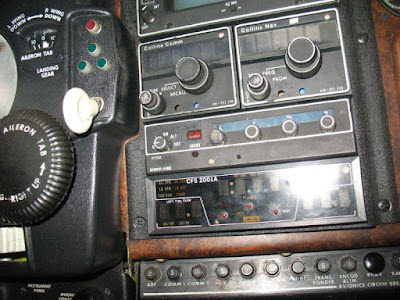 Wow, I'm going to be spoiled... that's the Synthetic Vision underlay showing on the PFD (left) and the XM radio interface on the MFD (right). Cruising in style! Follow the magenta line. The PFD is showing a TAS for 184 kts. A nice tailwind showing on the MFD with the NexRad weather overlay... nice! It was a good flight. Came out at 9000' with 180 knots true and 220 ground speed. Picked up a little ice at 7000' on the way down. Ran the prop and windshield deice along with the boots. It sue is a nice flying plane. I will miss the economy for sure. I will send pics tomorrow. I took them on my video camera and need to download them. Nice TAS! I can't wait to pickup the plane. I called the interior shop and requested they take "work in progress" photos of the job. I'll post the results here as they come in. Here is the full pre-buy report from Paul McCracken... he flew from DFW to Indiana to inspect the plane, left at 4 am, spent the whole day pouring over the airplane, that night pouring over the logs, and the next day answering a million questions via phone and email... Paul did a heck of a job and I highly recommend him to anyone considering buying a Beechcraft. • Engines start easily, run smoothly. Slight MP split at power. Mag checks OK. Left load meters reads 20% high. Prop Sync: hard to tell if it is working. Tested at 2200 RPM. All factory gauges appear to work, except as mentioned above. Instrument air shows over 6 psi-needs correction. • Paint is glossy, although some evidence of trapped “dust” under paint in a few areas. LH elevator shows filiform corrosion under paint. • No hail damage noted. • Cracked plastic tail vertical fin fillet piece. • Co-pilot window is getting cloudy from age. • Windshield in good condition. • Other glass appears in good condition. • Interior original, but clean. Missing some woodgrain trim inserts. 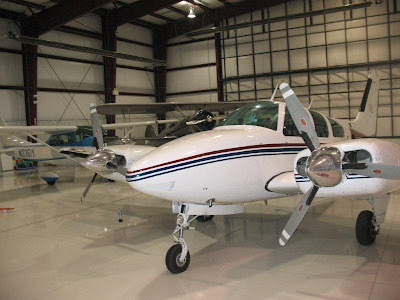 • No obvious hangar rash or airframe damage or dents. • Rubber flap bumper on RH flap needs replaced. • Pilot door seal appears recent. • Exterior cabin door handle spring not working. • Engine controls are all free and smooth. • Electrical check, incl pitot heat: OK.
• Tail light lens cracked. • Flaps operate normally. Indicator works. • Flight controls free and smooth. • Control surface attach points and hinges show no play. • Glareshield in fair condition. • Ancient Hoskins Fuel Flow computer system. • Electric trim operates normally. • Brake cylinders (pedals) appear dry, no obvious leaks. • Spar carry-thru: clean, no visible cracks or doubler kit installed. • Gear swing is normal, with normal hand-crank clearances. Gear doors fit flush. • Nose gear retract linkage tight, no slop noted. • Nose gear steering linkage in good condition, little play. • Wing attach castings (bathtub fittings) are all clean, no corrosion. • No signs of gearup landing repairs in nose or belly. • LED tail beacon noted. • Blade-type nav antennas on tail (good). • Engine cowls—exterior: very good condition. Some scratches on inboard RHE side cowl noted. • Alcohol props. Not tested. Spinners in good condition. No large gouges or nicks in either prop. • De-ice boots appear in good condition. Not tested. • No engine monitor noted, although GAMIjectors are installed. • Engine flexible baffles are poor. • Engine compartments show no major oil leaks or issues. • Exhaust systems and brackets check OK.
• Shoulder harnesses at all seats. • Strobe fences at wingtips have ugly silicone type adhesive repair. 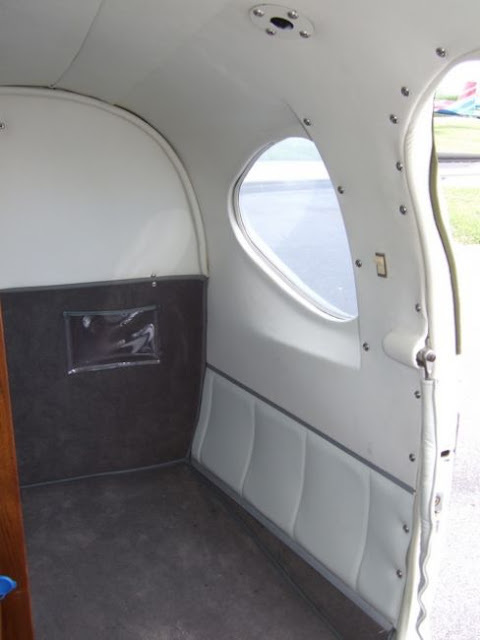 • Tail/empennage internally checked: clean, no issues. • Standby altimeter and Glideslope under G600 display. • Standby ASI and AH to the left of G600. • Backups: Collins Nav/com and KT-76A transponder. • GDL-69A datalink: includes Sirius Satellite Radio. • GMA 340 Audio panel w/music inputs. • Bendix-S-20 Series mags are good mags. • GPSS and WAAS enabled. • Wing bays (internal) very clean- zinc-chromated. 2008-13-17: Circuit breaker replacement. Due by 08/2010. 2007-26-09: Hartzell propellers. Will be complied with at OH. 91-17-01: Trim tab actuators. Permanently complied with. 90-08-04: Spar carry-thru. Due in roughly 200 hrs. 89-05-02: Elevator horns. Aluminum. No further action. Heater Pressure Decay Test AD: Due now (overdue). inspections with little documented. Overall, average. Mags: Have not been overhauled since new in 1989. LHE: both mags had the points replaced around 200 hrs ago. Left mag was replaced with a used serviceable mag recently. RHE: original mags, no internal work documented. Instrument Air pumps: RHE- 590 hrs TIS (1998) LHE- 550 hrs TIS (1999) 500-hr recommended replacement interval. Alternators: one was replaced at 2322.2 Hobbs time. Other has 1310 hrs and 20 years since new. Recommended inspection interval (coupling and bearings) 500-hrs. 1991: All cylinders were replaced under warranty at 110.5 SFREMAN. All cylinders now have approx 1200 hours SNEW. 1997: Complete strip and paint. Myrtle Beach, SC. 1998: Oil cooler replaced on RHE. 2000: Alternator replaced at 2322.2 Hobbs. 2000: Flap motor and flap gearbox OH @ 2354.7 Hobbs. 2000: All engine control cables replaced. 2003: Landing gear motor replaced at 2681.3 Hobbs. 2003: RH inboard fuel cell replaced. 2003: LHE prop blade seal replaced for leak. Not an IRAN. 2007: Inner and outer LH fuel cells replaced. 2009: New cabin door seal. 2009: Starter adapter replaced. RHE. 2719.0 Hobbs. 2009: G600 and other major avionics upgrades. 1. Props need overhaul soon. 20 years and 1310 hours is excessive. Airplane will be smoother after they are OH’d, guaranteed. 2. Old alternator is well past its recommended OH interval. 3. Left load meter reads 20% high. Repairs needed. 5. Instrument air regulator(s) need adjustment. Too high. Simple fix. 6. Check prop sync operation. 8. Monitor the low cylinders on the LHE for exhaust valve wear. 10. Heater PDT test is overdue. AD must be complied with. 11. Engine baffles should be completely re-worked with new rubber at next annual. Kits are available. DIY? 12. Strongly encourage you to get a modern engine monitor to utilize the GAMIjectors and operate your engines the right way. 13. Cloudy cabin door window can be replaced with a window that has a vent window in it by the mobile window guy, DBM Mods, Jim Klug, http://www.dbmods.com/ A master craftsman. 14. Get rid of the dual yoke after you get your check out. 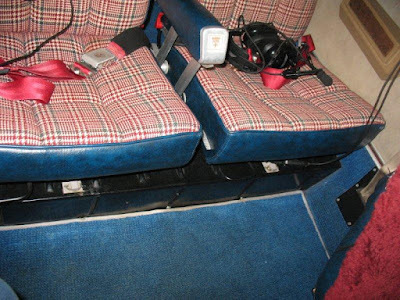 Your copilot/passenger will love the room the single affords. And flopping it over in flight is simple. You can make around $2k on it. Dual yokes on this vintage Baron & Bonanzas were meant for training only…they get in the way, otherwise. This report is for information only and does not constitute an inspection under FAA Part 43 or any other Part. Overall the paint is in great shape, it was painted in 1996. It's not a perfect paint job, but it shows well on the ramp and the plane has been kept in a heated corporate hangar so it's held up well over the last 13 years. 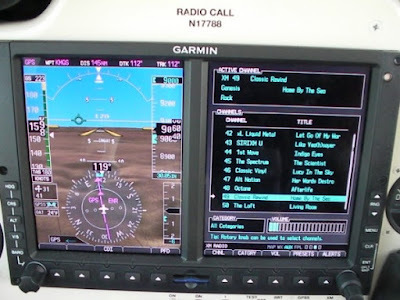 The panel is insane... Garmin G600 with synthetic vision technology, Garmin 430W, Garmin 330 transponder with TIS traffic displayed on G600, Garmin 340 audio panel with 2 music inputs and GDL-69A with XM radio and weather displayed on the G600. Primus 100 color radar, Century IV autopilot with GPSS roll steering, alt hold, and CWS. Hidden under all those Garmin goodies, it's still got some old and obsolete 70's tech, including Colins #2 radio and a backup King transponder. I'll replace those eventually, no clue why I'd need two transponders... the thing on the bottom is an old Hoskins fuel flow gauge. Useful even though it's obsolete... but I should replace it with an engine monitor at some point. Though the plane has Gammi injectors that should let me run lean of peak for greater efficiency, it lacks an engine monitor... weird. It's true I bought a Baron. 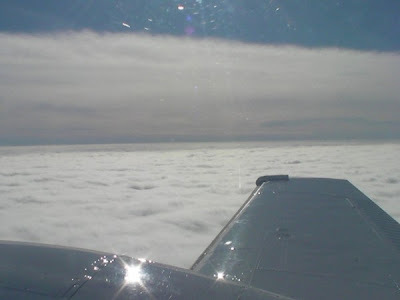 When I started thinking about a family plane I quickly figured out that if you've got two kids and a big dog and want to take a trip of any length, the options are sort of limited. Basically in my budget it came down to a late 70's A36, a 210 or Saratoga. 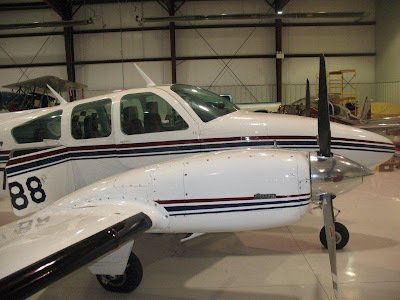 After doing some research and kicking some tires, I came to discover that what people say about "Beech quality" is basically true... the difference in build quality between the Bo and a 210 or a Saratoga (or even my beloved Grumman Tiger) is palpable. The problem is, the price reflects it. I had pretty much decided that the A36 was the plane I wanted with the 210 a close second. 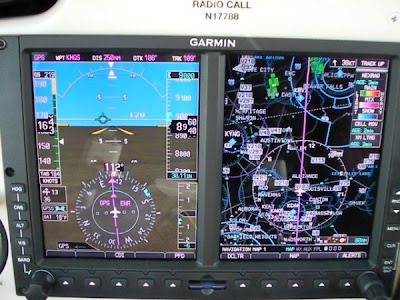 I wanted a modern panel though and I imagined I'd add a G500 after some time, so I wanted something that already had a Garmin stack. I spent some time searching and doing my research on years, models etc. I even tried to persuade a guy I met into selling me his A36 as I knew wasn't flying it much. One thing I realized though is that while the A36 is a six seater, with full tanks the useful load is not great, especially on later models. 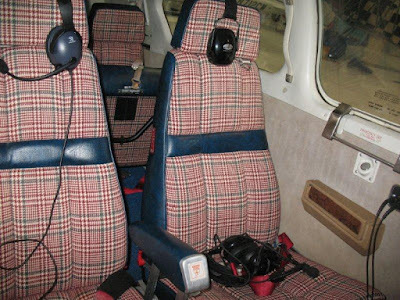 The 210 fares a bit better, but those back two seats are basically jump seats and it's flies like a truck. I figured out that you get a 300 lb load boost from a TN A36. A nice TN A36 runs north of 170k though, and there are lots of reported problems with the stock Turbo. A tornado alley system works much better, but costs 50k to add. Add in a G600 and I'd have 250k or more invested. So I kept looking and looking for a deal. My friend Mike invited me to a BAC event at Watts/Woodland, and I got to talking with a BAC member named Bob and mentioned I was looking for a Bo. He suggested I talk to this cat Bruce Watts who runs a Beech service center. I called him up and next thing I know he is offering to be my buyers agent for 10 grand. That seemed a bit steep to me but I flew up, met him and heard him out. He mentioned that Baron's are going for a steal right now, and that Mx numbers are not quite as scary as everyone thinks. So I made the mistake of taking a test flight in the Baron and after that I was pretty hooked. There's nothing on this planet quite like the feeling of pouring on the coals of a Baron and rocketing off at 2500ft + per minute. I did more of my own research and came to the realization that the most bang for the buck in a any plane on the market right now, is the Baron 55. I ran the numbers and the spreadsheets and the poured over controller.com and trade a plane. I connected with beechtalk.com (great site) and go advice about the "buyers agent" proposal. Basically a bunch of folks there advised me that 10k is too much and a buyers agent is not necessary... instead put that money towards a good pre-purchase inspection and the first annual. 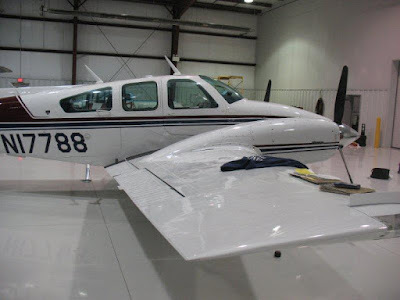 I got hooked up with an awesome A&P and Beech guru named Paul McCracken, and also the guy I ended up buying the plane from. 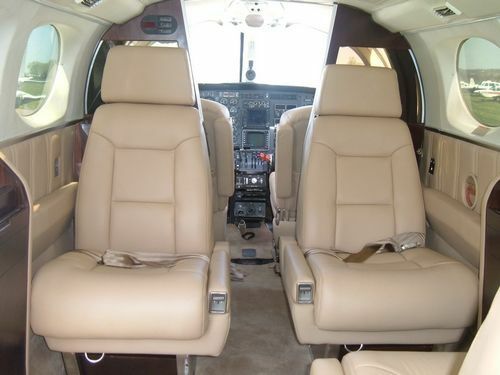 The plane had already been upgraded with Colemill engines and a G600, and was priced about right. So I made an offer and the next thing I know I'm sending Paul off for the prebuy inspection. The prebuy went pretty well, some niggling things here and there and the most significant item being that the props are due for overhaul on years (not hours). 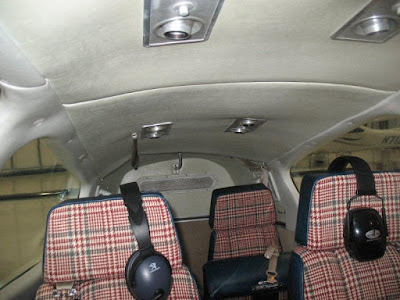 Otherwise the airframe is super clean and it has everything I was looking for and more with the exception of the interior which I'm having redone by advantage interiors (http://www.advantageinteriors.com) for the unbelievable price of 8k. So I'll overhaul the props and slap in a new interior and I'll have a pretty insane airplane that will haul a lot of weight very quickly with twin engine safety (arguable I know) and glass panel reliability including synthetic vision. So that's the story, it's a fat plane with 600+ HP and I'm super excited to get her home. I will fly out to PA after the interior is done and fly her back, which will be my first coast to coast piloting adventure.